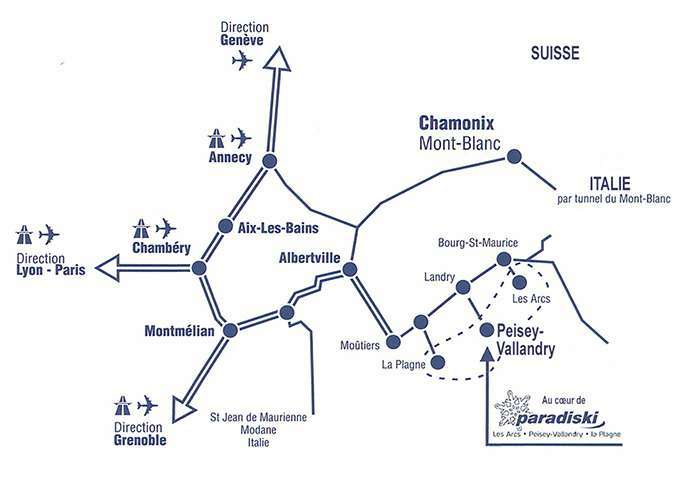 Then RN90 2 x 2 ways Albertville-Moûtiers then LANDRY in the direction of Bourg St Maurice. For the conditions of traffic on the main trunk roads of France, consult Bison Futé. In order to reach the ski resort in the best conditions, equip your vehicle with snow tires and it is essential to have snow chains stored in your trunk. Snow socks are now admitted although they’re not as efficient as snow chains. In case of bad weather conditions, only the vehicle equiped with snow tires and snow chains will be allowed to continue there route. In order to save time, practise the fitting and removing snow chains. Indeed, you will maybe have to fit the chains in bad conditions, cold, snow, at night, on the side of the road. Make sure you have a pair of gloves and a torchlight. At the end of your stay, you must take off the snow of your car. Keeping snow on the car might be dangerous while driving.